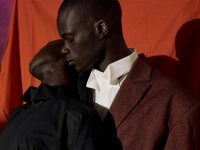 Photographer Alex Lockett and stylist Ai Kamoshita explore the interrelated points of domesticity—people, clothing and furniture—in this Spring / Summer 2018 editorial for Document. 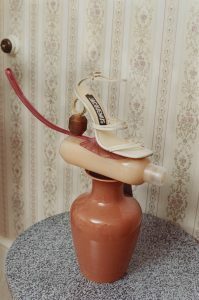 In Lockett and Kamoshita’s universe, fashion and household domestic items work in unison, where models bend to the shapes of domestic objects, contorting into human utility sculptures. 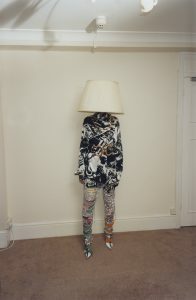 Elsewhere, the pair invert these relationships, injecting droll domesticity with high fashion as models are incorporated into dated interior landscapes with deft touches of levity, absurdity and, household-variety irony. 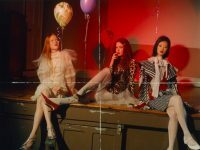 Models Olympia at Milk Management and Saana at M+P. Hair Kiyoko Odo. Make Up Nicola Brittin at Saint Luke. Set Design Alice Kirkpatrick at Streeters. Photographer Assistants George Eyres and Lallie Doyle. Stylist Assistant Hannah Hetherington. Set Design Assistant Staci-Lee Hindley. Casting Edward Kim at the Edit Desk. Location and Special Thanks Walpole Bay Hotel. Saana wears top and skirt by Mulberry. Glasses by Andy Wolf. Vintage earrings and necklace from Gillian Horsup at Grays Antiques. Shoes by Y/Project. 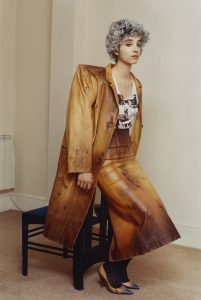 Olympia wears shirt and belt by Céline. Leggings by Laura Deanna Fanning. Pants by Paco Rabanne. Vintage necklace by Dior from Rewind Vintage. 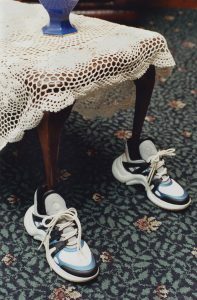 Shoes by Balenciaga. 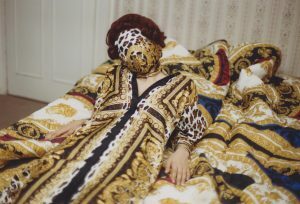 Olympia wears bra, dress, and scarf on quilt and pillow by Versace. Olympia wears shirt and skirt by Kwaidan Editions. Vintage tights and shoes by Céline. Left: Olympia wears shirt and pants by Y/Project. Shorts & vintage socks by Emporio Armani. Coat by Miu Miu. Vintage earrings by Gucci from Rewind Vintage. Shoes by Pierre Hardy. Right: Saana wears dress, vintage sweater and vintage scarf by Fendi. Earrings by Balenciaga. Vintage necklace from Gillian Horsup at Greys Vintage. Vintage bracelet by Chanel from Rewind Vintage. Shoes by Pierre Hardy. Olympia wears vintage skirt by Fendi. Sandals by Prada. Right: Shoes by Louis Vuitton. Left: Sanaa wears tank, skirt, coat and shoes by CALVIN KLEIN 205W39NYC. Vintage stockings by Céline. Saana wears t-shirt, cardigan, pants, earrings and shoes by Balenciaga. Sunglasses by Andy Wolf. Left: Saana wears top and skirt by Jacquemus. Vintage shorts, scarf and slippers by Dior. Vintage earrings from Gillian Horsup at Grays Antiques. 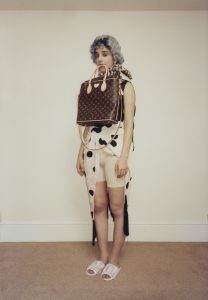 Bag by Louis Vuitton. Right: Shoes by Jacquemus. Olympia wears dress by Hillier Bartley. Vintage earrings by Chanel from Rewind Vintage. Vintage socks (worn as gloves) by Louis Vuitton.